Apple Accused Of Removing Apps Used To Evade Censorship From Its China Store : The Two-Way VPNs can be used to skirt China's "Great Firewall" of Internet censorship. China is among Apple's biggest markets, and the company has shown a willingness to comply with Beijing's demands. 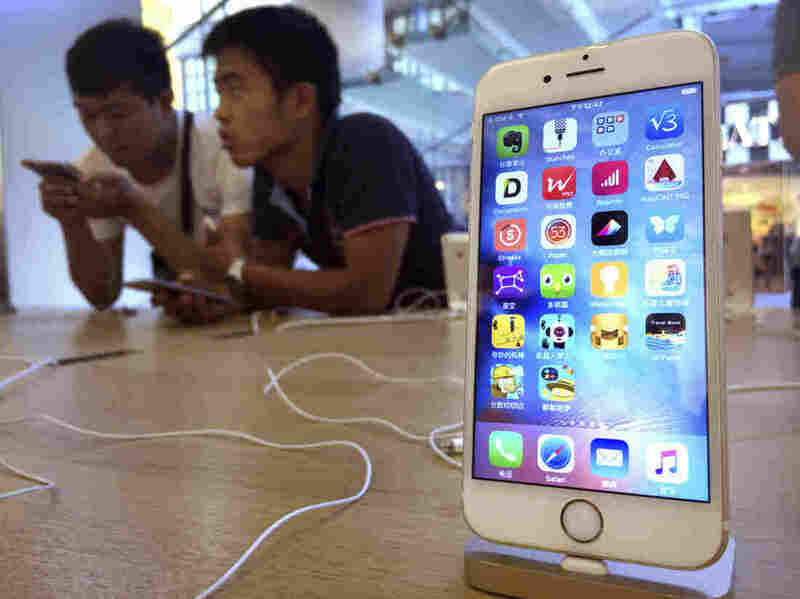 Apple has been accused of removing apps from its China App Store that can be used to skirt the country's Internet filters. Above, customers at an Apple Store in Beijing in 2016. There are iPhone apps that make it possible to get around China's notorious Internet filters. And on Saturday, makers of those apps said Apple had removed their products from its App Store in China. It would be another sign of Apple's willingness to help Beijing control its citizens' access to the Internet. The apps create virtual private networks connecting a user to the Internet via an encrypted connection. In China, VPNs can be used to skirt the government's extensive system of internet controls, sometimes called the "Great Firewall." "We received notification from Apple today ... that the ExpressVPN iOS app was removed from the China App Store," app maker ExpressVPN said in a blog post. "Our preliminary research indicates that all major VPN apps for iOS have been removed." "We're disappointed in this development, as it represents the most drastic measure the Chinese government has taken to block the use of VPNs to date, and we are troubled to see Apple aiding China's censorship efforts," the company added. ExpressVPN, which says it is headquartered in the British Virgin Islands, posted a screenshot of the notice from Apple that its app "includes content that is illegal in China." Another company, Star VPN, tweeted that its apps were also removed from the China App Store. In an email to NPR, Apple said: "Earlier this year China's [Ministry of Industry and Information Technology] announced that all developers offering VPNs must obtain a license from the government. We have been required to remove some VPN apps in China that do not meet the new regulations. These apps remain available in all other markets where they do business." The New York Times reports that Internet crackdowns in China tend to happen about every five years, timed to precede an upcoming congress of the Chinese Communist Party. The Times notes that China is Apple's largest market outside the U.S. In December, Apple pulled the Times app from its app store in China. ExpressVPN says its apps for other operating systems remain accessible and that it's possible (though it's not easy) for Chinese users to create an account to access another country's App Store, if they list a billing address elsewhere. If they can do so, they can still download VPN apps for the iPhone. The government's focus on cutting out VPNs is said to be taking other forms, as well. "A southern China data-services company with over 160 clients said it received orders last week from the Ministry of Public Security, which runs China's police forces, to cut off access to foreign providers of VPNs," The Wall Street Journal reported. "Those orders came days after a luxury hotel in Beijing, the Waldorf Astoria, said in a letter to guests that it had stopped offering VPNs 'due to legal issues in China.' " The newspaper noted that it was unusual for Apple to remove several apps at once. Apple announced earlier this month that it's building a new data center in Guizhou — its first in China — that will comply with new Chinese cloud storage regulations. It's part of a $1 billion investment in the southwestern province. Bloomberg reports the tech company's market share has "fallen as consumers wait for an updated iPhone 8, which is likely to be released later this year, or switch to cheaper Android devices."